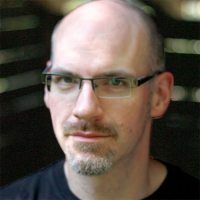 Matt Moore is an author, columnist, and poet whose works have appeared in On Spec, Leading Edge, The Ottawa Citizen, Jamais Vu, The Drabblecast, and more. Beyond writing, he is the Co-Chair of the Chiaroscuro Reading Series (ChiSeries) Ottawa branch, an award-nominated, quarterly reading series. For more information visit mattmoorewrites.com.